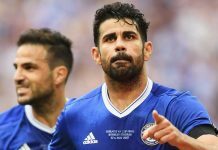 The Blues captain has gone public in announcing that he wants to sign a contract extension with Chelsea keeping him there for another year at least. The former England captain is keen to stay on and feels he is doing enough to warrant a new deal, many supporters will agree. The fact that he is continuing to be a dead cert in the starting line up ahead of Gary Cahill and Kurt Zouma, says it all and really shows the faith Jose Mourinho has in him. Terry, albeit lacking the pace he never even had in the first place, has had another decent season at the heart of the Chelsea defence and reads the game better than most. He defends the goal like it’s his life and the team look lost without him. I’m fairly certain that the Chelsea board will make the right noises and move to keep Terry at Stamford Bridge for at least another year, so that he can add to his already incredible 656 appearances.